Many thanks to all of the presenters and attendees who made the Seattle program successful this year. Please join me in congratulating our colleagues who received awards during the AAFS 70th Annual Scientific Meeting. The T. Dale Stewart Award: P. Willey was awarded the 2017 T. Dale Stewart Award for his outstanding contribution to forensic anthropology. 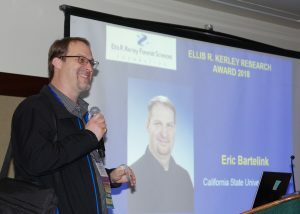 We look forward to passing the award to Elizabeth Murray at the 2019 meeting. Congratulations to P.! P. Willey is awarded the 2017 T. Dale Stewart Award. The J. Lawrence Angel Award: The Anthropology Section is pleased to announce that Caitlin C.M. 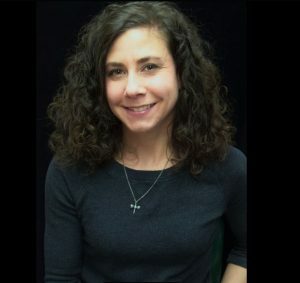 Vogelsberg is the winner of the 31st annual J. Lawrence Angel Award, a Forensic Anthropology Student Paper Award, for her research and presentation at the 70th Annual Scientific Meeting of the American Academy of Forensic Sciences in Seattle. Currently a doctoral student at Michigan State University, Ms. Vogelsberg’s paper was titled “Assessing the Spatial Patterns of Undocumented Border Crosser (UBC) Deaths in the Southern Arizona Desert.” Todd Fenton serves as Ms. Vogelsberg’s research adviser. Congratulations to Caitlin for her excellent research and achievement! Caitlin C.M. 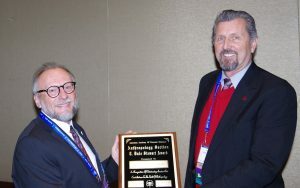 Vogelsberg, winner of the 31st Annual J. Lawrence Angel Award. 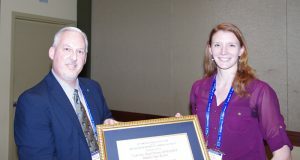 Michala K. Stock received the Anthropology Section’s 2017 J. Lawrence Angel Award, a Forensic Anthropology Student Paper Award, from Committee Chair Thomas Crist at the 2018 Academy Meeting in Seattle. 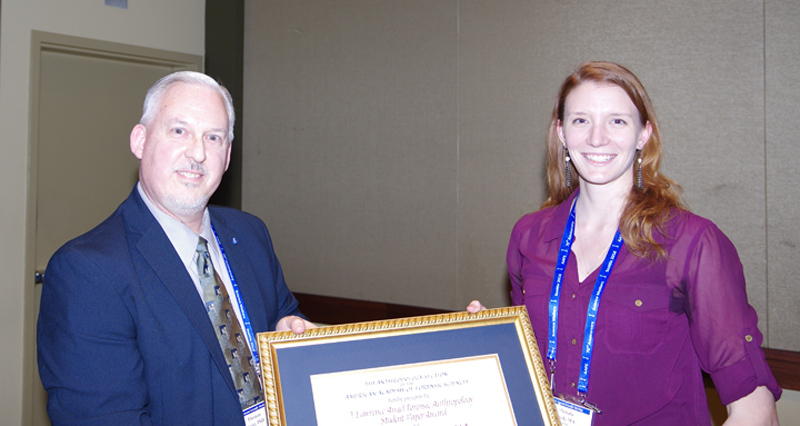 Michala K. Stock receiving the 2017 J. Lawrence Angel from Committee Chair Thomas Crist at the 2018 Academy Meeting. Dr. Eric Bartelink recieves the 2018 Kerley Award. We wanted to remind you all to be thinking of ideas for abstracts, workshops, symposia, and special sessions for the AAFS 2019 meeting in Baltimore, MD. The August 1 deadline for submissions will come faster than we expect. If you would like to volunteer to moderate a session or review abstracts, please contact your Program Chair (dr.khartnett@gmail.com) and Co-Chair (mpilloud@unr.edu). The theme for the AAFS 2019 meeting is “Diligence, Dedication, and Devotion.” AAFS President Susan M. Ballou brings into focus the fact that many of us are on call 24/7, we stay late to get results, we are often called out of bed to respond to work situations, and we choose our jobs in order to help society. As you formulate your papers for this year’s August 1 abstract deadline, please consider the elements above. We welcome special session, speaker, or symposium ideas, so feel free to contact us at any time with questions, suggestions, or proposals. Thank you. Also, Thomas Holland, Chair of the Organization of Scientific Area Committees (OSAC) Anthropology Subcommittee, is pleased to announce that OSAC has approved posting the Scientific Working Group for Forensic Anthropology (SWGANTH) documents on their website. They can be found under Discipline-Specific Baseline Documents here: https://www.nist.gov/topics/forensic-science/anthropology-subcommittee. You can also view the documents in progress and read about other OSAC activities there. ← Toxicology Section News—Thank You, Seattle, for a Wonderful 70th Annual Meeting!